CHICAGO (WLS) -- One person was killed and two others were seriously injured in a crash on the inbound Kennedy Expressway near the Hubbard Street Cave overnight. 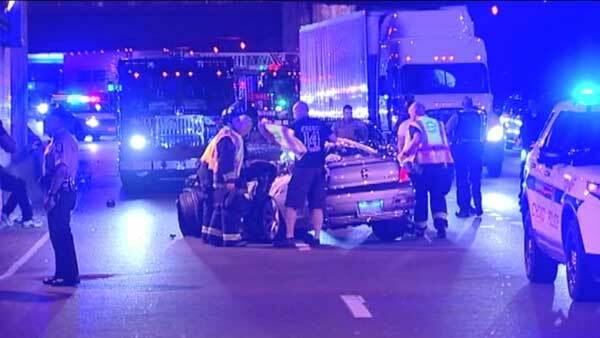 Illinois State Police said a semi truck and a car collided just before 2 a.m. Wednesday. The roof of the car was crushed. One person was dead at the scene, police said. Two people were transported in serious condition. One was taken to Northwestern Memorial Hospital and the other was taken to Stroger Hospital. Police closed four of five lanes in the tunnel for about four hours early Tuesday morning to clear the crash and conduct their investigation. Lanes began to open up around 6 a.m.